Hot on the heels of the QHW The Vinyl and the Gold Note PH10, arrives the £1400 Long Dog Audio MCJ3 Hybrid Valve Phono Stage. 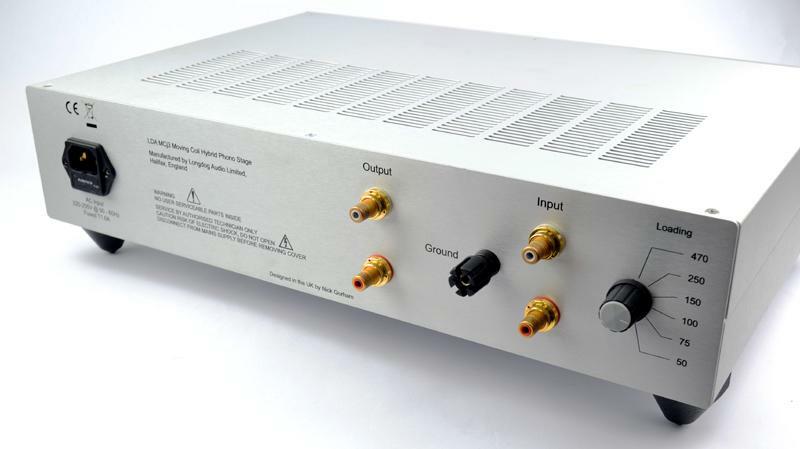 This is keenly priced below the LDA MCJ2 phono pre-amplifier (priced at £1900) by being sold directly to the listener. Long Dog Adio (LDA) also make the entry level £199 LDA PH1, in a solid case with wall-wart SMPS, competing directly with the Tisbury Audio Domino. LDA offer power supply (PS) upgrades for the LDA PH1. Long Dog Audio are big on power supplies and offer a range of potential upgrades for various popular products generally perceived to be limited by their standard power supplies. All amplification devices are, when all is said and done, merely modulated power supplies. Your Old Scribe was shocked as a young Scribe, to realise the difference a PS can make to something swinging such tiny signals as a phono stage. Even the baby Long Dog model eschews electrolytic capacitors in favour of film types throughout. Designer Nick Gorham sticks to his principles. The Long Dog Audio MCJ3 Power supplies include chokes, which have made a welcome reappearance in recent years in audio amplification. Choke (old word for inductor, not to be confused with automotive chokes) based filters (the inductor makes up a 2 pole filter with a capacitor) rather than 2 resistors with 2 capacitors for 2 pole filters. Chokes in place of resistors have many advantages in terms of smoothing, source impedance and noise. However, inductors are more expensive to achieve similar time constants with clumps of capacitors & resistors, and inductors are bigger and heavier too. For equal ripple, a choke PS filter will outperform a resistor based filter for noise and impedance. Unusually LDA supply an aftermarket mains power lead instead of the usual kettle flex, included in the price. The IsoTek EVO3 can usually be bought, at best (YMMV) for about £55. This is a significant implied statement by a manufacturer, that the mains cable can make a difference to a high gain, small signal amplifying device and that they have identified what design type and quality level is most appropriate. "What about the miles of wire between substation and wall socket" argue the Plebs' Chorus, stage left, "Only cable sellers believe that the last metre of wire makes that much difference, surely?" Perhaps the significance of aftermarket IEC mains wires concerns the interaction between the numerous devices plugged into the adjacent outlets, not the impedance characteristic to the electricity generation infrastructure. And stop calling me Shirley. The Long Dog MCJ3 is an altogether more significant investment than the LDA PH1, but confusingly lower in price than the longer in the tooth Long Dog Audio MCJ2, achieved by being a direct sales only product. Long Dog Audio are a company in the finest traditions of UK audio pioneers, being the brainchild of one man, Nick Gorham, and based in God's own county, Yorkshire, like so many audio pioneers before. 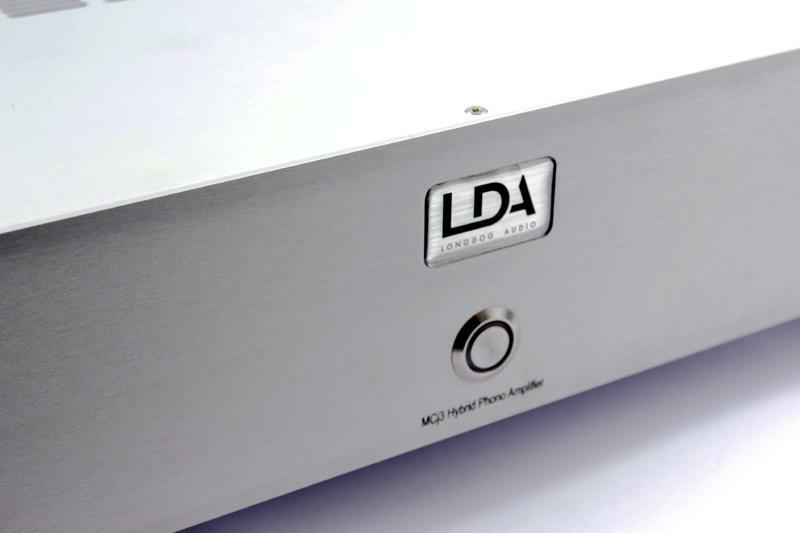 The LDA MCJ3 benefits from a few more years development and experience and more of the spin off R&D of the MFA Reference 1 phono stage, whose active circuits Nick Gorham also designed. The Long Dog MCJ3 measures a fairly standard 450 x 115 x 320mm so it should fit most equipment racks. The LDA MCJ3 feels substantial, built from non-ferrous materials with a thick aluminium front panel. Your Old Scribe rates aluminium more highly than steel for casework because it provides screening without being magnetic. Phono stages are very sensitive to interference due to their high amplification factor and only prohibitively expensive sheet copper has any advantage over aluminium according to some of the wilder Japanese mountaintop dwelling gurus. Vibration control is offered by what look like RDC cone feet, which work on similar principles as the now obsolete but class-leading PolyCrystal Reference Isolator footers. The top plate can resonate and during listening tests we will consider whether additional vibration damping is beneficial. The Long Dog MCJ3 was installed on the excellent Something Solid XR4 rack which effectively isolates it from structure borne vibrations. Input load can be selected by a rotary switch topped with a knob familiar to anyone who has ever navigated around a mixing desk. Correct input load is essential to getting a flat frequency response and correct phase response from any electromagnetic generator (which is what a cartridge is) because the inherent inductance, capacitance and resistance (LCR) of the generator coils react with the input impedance creating a complex filter. On top of that task, is the whole business of raising the tiny amount of electrical power generated by the movement of the coils in a magnetic field, to the standard line level required by power amplifiers, explained in our review of the Gold Note PH-10stylus wiggle in the first place. RIAA accuracy is essential for a phono-stage, the musical spectrum of each instrument, its timbre if wooden, is defined by accurate frequency response. possibly due to the large amount of gain and EQ involved, research demonstrates that humans are more sensitive to errors at this stage in the amplification chain than elsewhere. Nick Gorham of Long Dog Audio specifies 0.1% resistors and selected 1% capacitors in RIAA filter. Those resistors are Tacman and there are Mundorf (as in the Canor TP306 VR+) and Clarity Cap capicitors present too. Best of all, moving coil load is operated by a decent sized knob on the back. It can be reached from the front by nimble fingers, so can be changed on the fly while fine tuning cartridges. Interestingly some moving coil cartridges benefited from a slightly different load on the LDA than on the resistor loaded Lundahl step up transformers on the Canor. Further teaking would be possible tube rolling the ECC88 (aka 6922) and ECC82 (electrically similar to the popular octal 6SN7) which are widely available as modern or NOS brands, unlike the d3a pentode and milspec (JAN=Joint Army Navy) JAN 5687 triode (beloved driver valve of many SET aficionados) Nick Gorham chose for the Music First design. MC phono stages need to amplify tiny signals. To raise the level with the minimum of noise, sufficient to activate the grid of a valve, traditionally matching transformers are employed, as in the Canor TP306VR+. Transformers do have their drawbacks, particularly in terms of high frequency phase shift, so many designers consider ultra low noise solid state devices like JFET's (William O Johnson of Audio Research and Yamaha used them in their classic pre-power B2 combination and Sony have been choosing them in common source mode since the 1980s for their high end audio products. Thus, Long Dog Audio eschew small signal transformers in favour of JFET's. There are established high end MC phono stages taking this route at much higher prices. A Toshiba JFET (which are noted as displaying characteristics similar to valves) raises the input voltage to sufficient levels for the twin triode ECC88 valve (aka 12AX7) valve. The JFET makes this valve choice possible, rather than a more typical high gain phono stage valve like the ECC83 twin triode. The following stage is the less used, on this side of the Atlantic pond, ECC82 twin triode. This is similar electrically to the, much loved among all triode acolytes, octal base 6SN7. Long Dog use the ECC82 shared between both channels. B9a base valves can suffer from more crosstalk between sections than their Octal cousins, but tend to be less microphonic due to smaller grids and plates. A mix of brands & types of passive components means that there ought to be no obvious sonic signature. No component is without distortions, or non-linearities, and part of the task of the designer and builder is to balance these and minimise their impact within the design brief. Therefore your Old Scribe notices carbon film and metal film resistors and a selection of good quality film type capacitors, without indulgence in excessive audiophoolery. There is a jump in volume from the Canor, allowing more gain without any extra noise. This enables less gain further downstream resulting in a slightly lower noise from the electronics balanced by slightly higher impedance noise from the Benz Micro lurking in the SME309. The higher gain needs accurate adjustment (C weighted extended HF analogue Radio Shack meter the digital model has an inferior frequency response, double checked with an envoronmental health specced meter) to enable valid subjective comparisons. The ease of reaching around the end of the LDA MCJ3 back panel to change input impedance on the fly, enabled the discovery that a slightly lower input Z works best with this stage than with a transformer coupled input, which also reduced noise by about 3dB. The pedigree of the Long Dog Audio MCJ3 soon establishes itself. "Groan" expel the Plebs' Chorus, stage left, "The Old Scribe just cannot resist a pun"
The differences in sound quality between the Long Dog Audio MCJ3 and the Canor TP306 VR+ are surprisingly small. The Canor has a more expansive soundstage, but that could be reverb added by the more microphonic Octal base 6SL7 and 6SN7 valves adding their own colouration induced by the bigger plates and grids and also phase shift in the input transformer. The LDA MCJ3 offers tighter bass and better control of frequency extremes, which could merely be the difference between that Canor Lundahl input transformer and the LDA JFET input stage. The LDA MCJ3 offers more accurate high treble and its RIAA filters preserve phase integrity such that the highest harmonics of instruments are accurately positioned with the rest of the instrument, rather than retreating into the tweeters. Soundstage is bigger than the previously tested solid state equivalents, and positions remain stable whether solo or tutti, implying good power supply headroom. Massive bass does not swamp the other performers or mask information. It would just be possible to identify the Canor from the LDA blind, but the differences are slight. The stunning Roy Gandy (Rega) recording of Stephen Fearing: The Secret of Climbing would be expected to favour the Canor midband vocal euphony, but was arrestingly good (to the extent that a person outside the listening room stopped what they were doing and came in to listen) through the LDA MCJ3. 70's supergroup 801 Live (Manzanera, Eno, Monkman etc) complex jazz influenced proggy noodling was served with gusto. Hendrix Kramer remastered out-takes Both Sides of the Sky offered new insights into what have been familiar posthumous fare. The ability of the Long Dog Audio MCJ3 to resurrect the dead continues with the David Bowie post-mortem release Black Star, demonstrated the LDA MCJ3 fine PRaT preservation. The 2018 Verve release of John Coltrane's The Lost Album also revealed the LDA phono pre-amplifier's capacity for what Allan Wright called downward dynamic range; the capacity for notes to decay into recorded ambience and for the subtlest nuances of performance to be intact beneath potentially swamping foreground content. The catacomb playlist did not extend to the Resurrection Shuffle nor to the Greatful Dead this week, the Plebs' Chorus will be relieved to note. Q&A to LDA designer Nick Gorham who also designed the Music First Audio (MFA) active amplification with Jonathon Billington, but MFA predictably uses transformer step up for MC, in addition to their £9840 phono MM (moving magnet) pre-amp to achieve similar MC gain. TNT-audio: How do you differentiate it from the more expensive MCJ2? Nick Gorham: Its built with a few more years of experience, the biggest difference is the use of solid state shunt regulators lifted from the Music First Reference phono design. The older one had a single series regulator. TNT-audio: What were the ideas behind the decisions to use the circuit you designed, single-ended JFET-ECC88-ECC82 and how does it differ from the MCJ2 and the PH1? Nick Gorham: The goal was to produce an affordable valve stage with direct input for moving coil without requiring the use of a step up transformer. The PH1 is an all solid state and moving magnet only. The MCj2 is some years ago now. TNT-audio: What's the story on the power supply? Nick Gorham: Again it is copied from the £10,000 Music First Audio design. TNT-audio: Is it a choke input or a CLC (Capacitor – inductor – capacitor) Pi (Inductor/resistor – capacitor – inductor/resistor) filter?" Nick Gorham: CLC followed by CCS loaded shunt regulator. I dislike choke input in phono stages as the choke can end up radiating a large noise field making matters worse. Nick continues, The Long Dog Audio Mcj3 uses new non ferrous casework based on the MFA Ref 1. The cartridge loading selector is an ELNA switch instead of naff DIP switches. The lower price achieved by direct selling so one stage of markup is removed. I think that's about it. or a new Long Dog Audio MCJ3, although in other parts of the world the value balance may change towards the versatile Gold Note PH10 or the lower priced QHW The Vinyl. The LDA MCJ3 achieves this price by the simple expedient of direct sales and made to order, thus competing against rivals built to lower ex-factory costings. The Long Dog Audio MCJ3 phono pre-amplifier is the best unbalanced (in an electrical, not a wobbly way) phono pre-amplifier auditioned to date. There are few more expensive big brand alternatives, and those are burdened by shipping costs, import duties, importer margins, distributor margins and retail margins, which is akin to racehorses carrying a lot of weight. The key to Nick Gorham's business plan for this product is selling directly to customers. This does mean that the LDA MCJ3 are built to order, but then, all good things come to those who wait.